Every night my children go to bed with cheetah cubbies that may be leopards. They are cheap stuffed toys, the kind you see at the front of lesser family restaurants. Nothing extravagant, but wherever they go in the house, they are usually in the same room, many times next to each other. And each evening, they are needed for nighttime or there might be tears. The cheetahs started with my son when he realized how fast they were. My son has always loved to run. Back when he used to go to daycare and I would pick him up, on every nice day he would be in the playground racing with his friends. The teacher would just shout “Go!” and watch the kids run around and around again, not considering it was the parents that had to deal with the kids with sweat-soaked hair that would always need a bath later. Now my son wasn’t always the fastest, he did good, but there were always kids a little faster since they might be older or just plan bigger. But that didn’t matter to my son, he would always tell me on the way home how he won… even when we both knew he didn’t. He was Dash from The Incredibles for Halloween when he was four then the year after that The Flash. Whenever either costume was put on he would get this look in his eye, scream “zoom” and take off running around our house hoping to find a bad guy some place. A red blur of speed! Last Christmas, my daughter gave her brother a giant stuffed cheetah. (Well, actually the parents did but she happily took credit for it, she was one then.) My son immediately declared it was the mommy cheetah, and they both happily agreed. The cheetah cubbies were grabbed and quickly were reunited. 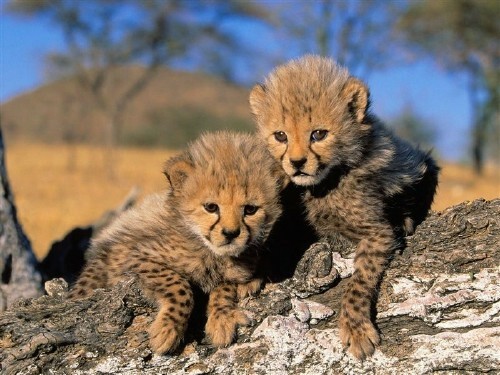 They are now a family of cheetahs. Both my wife and I have our things. For her, it is dance. She watches dance, writes about dance, teaches dance, has a website about dance (here), choreographies, performs, and has a master’s degree from a major university in dance. For me, it is all about books. I write about books (hello to my blog! 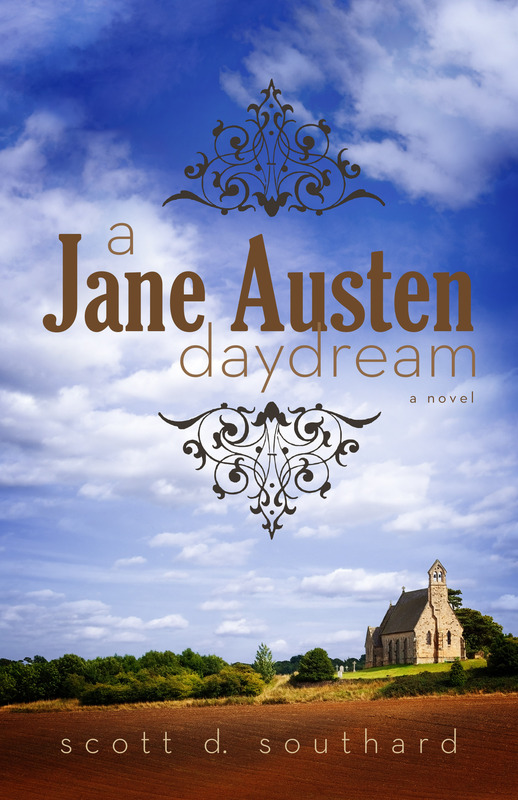 ), I do the book reviews for my local NPR (more info here), I work with writers, I write my own books (A Jane Austen Daydream, for example), and I have a master’s degree from a major university in writing. It is probably this passionate and focused drive in our fields that makes us such a good match. We see the mirror of each other’s obsession in the other, and when we had our first child it seeped into some of our parenting. The first time I noticed it is when we started to collect Fisher Price animals. For those that don’t know they are these plastic animals, some make noises, most don’t. They are in friendly colors, but really don’t teach anything. If anything they showed what animals look like if they ate too much dinner since they were quite chunky. Don’t fill up your polar bear! Even his noises sounded like he was complaining of a full tummy. For some reason, I thought having the complete set would give our son a love of animals. And so each time we went to a store we would look to see what was available there. Did they have an animal we didn’t have? And if they did, we would grab them quickly, expecting disappointed parents to be only a few feet behind us. The race had to be won! The second time our obsessive natures came to the front was because of some of our fellow parents. They had a son of a similar age and he was into Thomas The Tank Engine. We all sat on the floor with him building train tracks. It was fun, still is. And even though our friends kept warning us that it is all pretty expensive, my wife and I still got that look in our eyes. And on the drive home we both discussed what sets would be fun to have. I think we even looked at them on the internet before we took that first expensive trip to the store. Starter sets, favorite characters, a bridge, that was only the beginning as new characters and additions would find their way home all the time. And we went from there to Thomas sheets for the bed, a stuff Thomas for sleeping with, and I even took my son to an event where he got an actual train ride with Thomas! There he happily sat looking out the window listening to that awful theme and other songs from the show for the entire twenty minute train ride. Yes, I might not enjoy the show (I wrote about the missed opportunity of it in this post), but I was not going to let my son in on that truth. 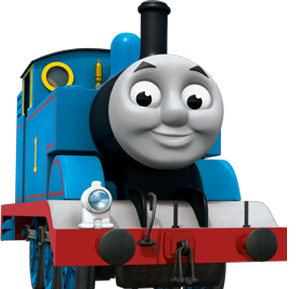 Yet, for all this work though, Thomas was not my son’t first obsession (they never went fast enough for him). No, it was just our last as parents, but not his first. My son’s first obsession of his own was Tigger. Yes, Tigger. The bouncy and lovable character from the Disney films. Every morning he had to watch a bit of a movie or show involving Tigger, he would hold his Tigger on the car rides, and when he went to bed each night we would have to read a book about Tigger. Unfortunately it was never the classic A.A. Milne stories, but some knock-off Disney tale. There were never enough pictures in the original Milne books for him. It was a bitter pill for me as a fan of Milne’s writing since the Disney books were never as witty and surprising as Milne’s masterpieces. The one thing they did do though was feature Tigger at the front and center in his bright orange. Now as important a character as the honey-loving bear. 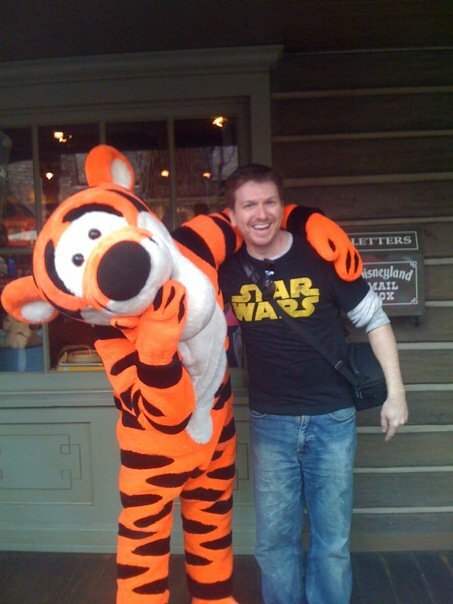 Heck when I went to Disneyland a few years ago (and had my picture taken with the celebrity, check it out), he appeared before the bear did… and had the longer line. I was not surprised. Tiggers can be like that. “I now know more about superheroes than I ever wanted to,” my wife has said to me on more than one occasion. It’s not surprising. They have taken over our house and while the fast heroes are usually my son’s favorites, the others are never too far beyond. Batman has more than enough vehicles to get around. Even Superman and Wonder Woman have cars (which doesn’t make any sense to me). Batman has a Batcave and there are more than enough bad guys around now to get. One of the good thing about the superhero obsession is that it is easier to find good shows around the characters. Batman: The Brave and The Bold and Teen Titans being my favorite to watch with him. Of course, sometimes it feels like the writers in Hollywood forget the characters were originally made for kids. My son even invented his own superhero character. He is the Grey Lightning. It is rare when grey lightning strikes but when it does bad guys beware! When I took him to see the new Superman movie (a move I still debate whether was a good or bad idea), he went in his own superhero costume, green cape and all. But it is more than one thing for him and he changes with the day. LEGOs, ninjas, puzzles, stickerbooks, cars… I was able to hold off Power Rangers, but I think that battle will be lost soon. As a parent, I have learned it is okay to lose a few battles… as long as it not with a bad guy. When I learned I was going to have a daughter, there were many promises I made to myself. One of the big ones is I didn’t want her hindered by the typical women stereotypes. I wanted her to believe she could do anything a boy could do. I imagined Scout over a girl playing in a makeshift kitchen, with dolls nearby and wearing a princess tiara (I wrote about my experience with princesses here). It sounds great in theory, but my daughter quickly told us where her preference lies. And each day I can be found reading badly-written princess books to her, watching Cinderella, and helping her with her babies since the diapers never seem to stay on. I have no idea where her obsessions are going to go in the future, but I know they are coming. It is inevitable as the prince waiting in the stories. This year my son will be turning six and one of his presents will be Disney Infinity. For those that don’t know the system. It is a game where you take on characters from Disney in different playable environments. I even got him his own remote just for playing the game in his favorite color (which currently is blue… everything has to be blue). This entry was posted in Parenting and tagged Batman, Batman: The Brave and the Bold, Blogging, Cheetahs, Children, Cinderella, Collecting, Costumes, Dance, Dash, Disney Infinity, Disneyland, Fisher Price, Halloween, Incredibles, Kids, Man of Steel, Obsessions, Parenting, Princess, PS3, Scout, Superman, Teen Titans, The Flash, Thomas the Tank Engine, Tigger, Toddlers, Toys, Writing by Scott D. Southard. Bookmark the permalink. This post was a delight to read! I remember as a child being obsessed with things and then moving on to the next thing just as fast. But I don’t think we ever truly abandon past obsessions, we carry them with us and while they might not be prominent anymore, they are still there. Even when your son grows up he will probably have some fondness for Tigger, though obviously not to the extent he did before. And he will probably always have a soft-spot for superheros. I think these childhood obsessions are necessary because even at such a young age, it is all about finding who you are as a person and exploring your interests. Well, for me I am still shocked how much I appreciate Star Wars, even though every fiber of my being was disappointed with The Phantom Menace. LOL. I always love to read how family members describe each other and have an awareness for each other; you know full well of each of your family member’s “things” (your wife, yourself, your sons multiple, your daughters). You display the wonders of the child who is always discovering new affinities… it’s bound to happen with any tyke! The trick for me is steering my kids towards things I don’t mind. It’s one of the reasons I have put up walls around Power Rangers. One of the worst written and acted shows on TV… But like I said, I’ll probably lose that battle in time. I liked how you made it obvious that your son is similar to you and your wife in both character and a state of mind when it comes to obsessions with the lines “the race had to be won” and a “a blur of red.” We all are still like children or our children are really just as complex as us, either way, it’s a nice reflection. I like that theme. And its valid. My nephews express characteristics of my sister and ironically myself. It’s like seeing someone walk around that shares your strengths (and maybe flaws which is always scary). I LOVE the lines “I have no idea where her obsessions are going to go in the future, but I know they are coming. It is inevitable as the prince waiting in the stories” I like the allusion to her growing up. The timing of when father is no longer the central figure in her world, but a prince, and the castle will be decked out with middle school, high school, and college dramas or parties—the growing up of an individual through life experience—its alluded here, which I found to be the most touching part of your essay. I think it is so touching because it seems from what I’ve witnessed and experienced, allowing kids to figure things out on their own (maybe even enjoy crap like the Power Rangers for example) is the hardest but the most fulfilling as the parental figure. It also seems the most important to us because maybe our parents didn’t allow us to be ourselves at one time or another, so we all want to ensure the next generation gets more life out of life than we did. I’m curious due to this post if you have any plans of writing short stories and clips of your memories with your kids and being a father and all. I’m new to your writings so if you already have, I apologize for asking. Wow! Thank you. I never considered my posts about my kids becoming something like that. I thought my children might get a kick someday out of finding them on my blog, but to make something more of them… You definitely gave me something to think about. The funny thing I usually think of myself more as a fiction writer. The fact that people dig my nonfiction so much is always surprising. Thanks for reading. I hope you come back to my blog again! I usually try to do three or so posts a week. There is always something fascinating to me about obsessions; as a person who will fall in and out of (many) obsessions, its always a really cool experience to be reminded that (thank god) I’m not the only one! This post really makes me think though; I remember my obsession with Disney movies (sorry), Dr. Seuss books, and my still relevant obsession with Harry Potter. I remember my older brothers fixation on building things; submarines, launching devices, tree forts, snow forts, sling shots, bows and arrows, even Works (the toilet bowl cleaner) bombs; though my mom stopped that one pretty quick. It’s really interesting to me to see what other kids may have been obsessed with, or even what adults are obsessed with. My question for you is more about your wife’s and your own obsessions; Have you guys grown up with this love of books or dance? I know I have always loved books, which is something that has stayed with me. Are these “things” that you guys love and write about something that you grew up with, or something that developed later in life? Why are you apologizing for loving Disney films? I love Disney. Big fan. I have read numerous books on Walt and have visited Disneyland more times than I can count (Even have some of the soundtrack for the rides on my phone right now). Disney is one of the great creative minds of the last century. My wife and I have always loved our artforms. She started dancing while a toddler and kept with it. Me, I can’t remember not reading. One of the “legends” around my family is I taught myself how to read at age three by memorizing a book. The funny thing is I can still recite that book- Whose Mouse Are you? I’ve been trying to fight my son’s affection for Power Rangers here, to be honest. I wasn’t so impressed with the writing and acting and it felt like every episode was structured the same. However, I can understand how that could be comforting if you grew up on it. I can get pretty emotional when I find an old Mr. Roger’s episode on PBS and they are all pretty much the same. I like the idea of being called an artist. LOL.